It’s officially fall! Fall is arguably my favorite time of the year. The leaves change, there’s no snow yet, and some of the best food ever is made. As the colder season sets in, it can be hard to find ways to stay active and healthy. Fall is notorious for food, between Halloween and Thanksgiving. We are overloaded with food to eat, especially desserts. Here are some suggestion of things to eat this fall to stay healthy. If, like me, you need your daily coffee fix to get started in the morning, then you probably know about pumpkin spice lattes. It’s presence on the menu usually marks the start of the fall season. While the Starbucks latte is delicious, it’s full of cream and calories. Many people are concerned by calories or ingredients in their diets, so to help out those who need more options, 100 Days of Real Foods made their own simple version of pumpkin spice drinks. As the chart shows, their recipe only needs five natural ingredients to make the latte. 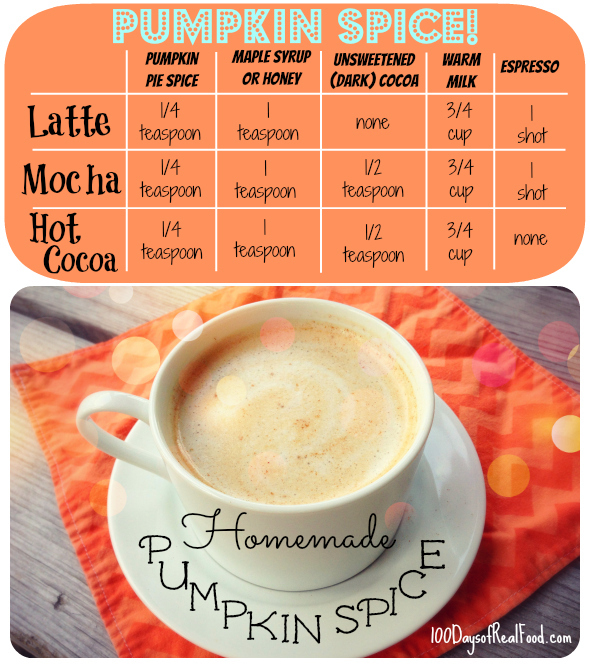 You can also use it to make a pumpkin mocha or a hot chocolate. Enjoy the best of fall and drink healthy with this natural recipe! Apples are one of the easiest and cheapest snacks you can have this fall. Not to mention, they are delicious. 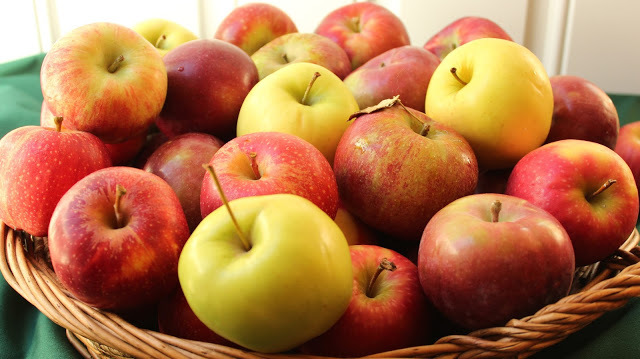 Apples are full of antioxidants and dietary fiber for your body. You can have apples sliced in a salad, with peanut butter, or on their own. This is perfect for anyone that needs on-the-go snacking! Butternut Squash can be added to so many dishes during the season, but one of my favorite recipes is from Food Network. 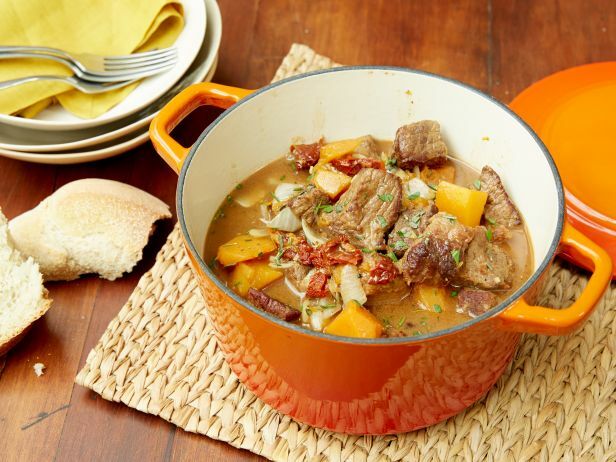 They have a recipe for a beef and butternut squash stew that is delicious and healthy. Trail mix is a super convenient snack, especially for college kids who are always on the move. With nuts, dried fruit, and usually a little chocolate, it offers a high protein snack with a lot of taste. The best part is there are so many options. Amazon sells several options, so you can find whatever flavor combination suits you best. Their cashew, cranberry, and almond one is great for fall. They have dark chocolate espresso, Tex Mex, and many other options as well. You can always add your own ingredients, too! Featuring ginger root, echinacea, rosehip berry—this herbal tea tastes like a hot fruit punch. Elderberry is a natural flu-fighter, so this is especially good for the cold season. Don’t forget about your immune system this fall! Besides eating healthier, fall is a great time to exercise as well. The weather is still nice enough to enjoy, and there are lots of activities to do outdoors. Discover park trails and take in some new scenery, whether you’re walking, biking, or in-line skating. In places where snow falls early, try cross-country skiing or snowshoeing. Or, if you live near the beach, get out and play volleyball, go for a swim, or play a game of fetch with your dog. Enjoy the off-season! If you live where the leaves change, don’t hesitate to go walk through the trees or go apple and pumpkin picking. These fun activities can burn a lot of calories without you even noticing. This is an easy one to follow in the summer. Come fall, though, you may not feel as parched. However, staying hydrated is still crucial to keeping your body running at its best, especially with the flu and cold season setting in. Fall is a great time of the year, but if you aren’t careful, the holiday season can take over your health. Use this list and other resources to make sure you are staying healthy and happy this fall with snacks, drinks, and exercise.